It’s been a packed week around here!!! I’ve got so much to tell you about, so let’s get right into it. Thank you to everyone that filled out the surveys I sent last week. I shared the DIY SEO course member survey results with them in our live workshop this past Thursday. And, I met with my Site Audit Plus clients and Webmaster Training folks earlier today to share results from their surveys. I asked folks if they listened to the podcast, and if so, where. Overwhelmingly, folks are listening from the site while reading the post. The next biggest listen place is iTunes, of course. I believe I’m going to make a major change with the podcast. I set it up 100 years ago, before I knew about services like Libsyn, and even before Blubrry had podcast storage. The files are on AS3 and I have no real idea how many subscribers I have. The only analytics are from the RSS feed, and that’s about 35,000/mo. But, I don’t know how many of those are bots or humans. Plus, after all these years, I still never show up in lists for the best WordPress podcasts. So, I’m thinking about seriously revamping. I may just close this one, rebrand, and start over. We’ll see, as that will be later in the year. For now, please do me the favor of leaving a review or at least a rating over on iTunes. Its makes all the difference in folks finding me and more folks getting this great info. I made these surveys as anonymous as possible with very few write-ins because I asked folks how much they were making with their sites and services. For site owners, the range was from $2k or less a year to over $80k/year. Now, I do have several clients that are just starting out and have had their sites for less than a year, and other non-profit clients who do not intend to make money with their site. But, not as many of those as the number of folks who are under the $5k/yr mark. So, that tells me that some of y’all are looking for super budget friendly ways of learning how to make your site better and/or need more help with learning how to make money with your site. I’ve got bunches of low-cost webinars and classes coming up for you to meet that need. And there were just as many folks over the $50k/yr mark. That tells me that you are more established and need ways to keep your site at the top of your niche and competitive. These are the folks who are likely keeping close tabs on Google Analytics and other content marketing feedback metrics too. And, it also tells me that your site is likely reaching a point of maxing out your hosting space and resources. I’m expanding the DIY SEO offerings this year for an advanced course, the anchor of which will be training on Google Analytics. In our current workshops, we’re also going to be touching on dealing with old content management. But the advanced course is going to go even deeper into that and help you set up a system to ensure that your content reflects your current marketing needs. And, ways to decrease your disk space overhead so you don’t have to go to a higher priced hosting package in the coming years too. I’ve also got courses on the drawing board for how to make your content stand out in these crowded niches. There are just too many cookie cutter sites. And you need ways to ensure you capture an audience that sticks like glue to you because you deliver something they can’t get on a hundred other sites. I also asked about Gutenberg and most folks have not tried it, but of the ones who have, an overwhelming majority of them can’t wait to use it. The recent WP 5 / Gutenberg flash training I ran last month was such a hit, and the demand for all things Gutenberg so high, that I’m currently developing a set of classes and services around it. The offers will include a Gutenberg blitz class, and the services will include site cloning, or setting up a sandbox for you to play with Gute in. And then theme revamp services too. I hope to launch that before the end of the quarter. Well, actually, I’ll probably start releasing it in February and continue to expand it through March. So, look for news on that in the coming weeks. For my webmasters, I was a little surprised to see how few folks are comfortable with Gutenberg, both in the use and in designing with it. So, I’ll be offering Gutenberg blitz classes for my webmasters too. And, we’ll be having presentations by some of the designers in the course about working with different frameworks and Gutenberg, including Divi and Genesis. Plus, it’s time for me to take a heavy hand to revamping the tutorials offered in the entire webmaster training, as needs have changed in that field. I’ll be streamlining the site security sections and adding a Gutenberg section. Plus, I’ll be doing another site performance and audit webinar series, as that’s the thing folks said they wanted the most help with. I’ll be sending out another series of surveys in the coming weeks, and these will have plenty of write-ins so you can tell me more about what’s helping you most with my courses and services, plus what you need more help with. Quick reminder that we will have our next live workshop in the DIY SEO course this Thursday at 3pm ET / 12pm PT. So mark your calendar now. This week we’ll be covering Technical SEO, which is all about whether Google is having any issues crawling your site, plus what its finding. Most of that info is in the Coverage Report on Search Console in the new interface. So, if you haven’t taken those GSC Live Labs yet, please do so. I’ll also have news for you about my recommendations for the robots.txt file and where I found some of those Coverage Report errors are coming from. So, it’s definitely going to be a super workshop. If you’re not already in the course, now is the time to join because you can still easily catch up with where we are in the live section. There are several video courses that are there all the time for you too. Thanks to everyone who shared what social sharing button plugins you are using. I’ll be sure to include them in my upcoming case study on speed, security, and Pinterest features. Did I miss one that you use? Please do leave a comment on the blog or anywhere you see this post online and let me know. As y’all know, I’m jumping up and down to get rolling on my woodworking site. And I’m disappointed that I will miss just about the whole month of January for getting going with blog posting. I’ve even had to curtail Instagram and Facebook posting for a bit. I tried to do a tool review video from my shop and it was just awful. The wall backdrop was ugly, the floor is a mess. And my phone just didn’t perform well to record the video and audio. So, I decided to make a big investment into my success by purchasing a new Canon M50 camera kit that also came with a Rode mic. And I’m hiring pros to do an acid wash on the floor and paint it. I’ll be mudding and painting the wall as soon as it warms up enough to do it, hopefully later this week. It’s not only setting me back in time, it’s another $1500 to sink into this biz. But, I know it will earn me way more than that, as these are going to be the mass appeal videos and blog posts. It’s all about growing my traffic for the first 6 months of 2019, and this is what it’s going to take to do that in a big way from the get go. I don’t have to present an HGTV quality workshop. But, I do need to have a clean place with no visual distractions, and high quality video and audio. Plus, I get to write all of this off my taxes. I’m also pretty thrilled about getting to write off more of my new home’s square footage for this enterprise as well. That includes the art room and the shop plus my office. And, I picked up the last of my new power tools this weekend. All of them are still in boxes, over in a corner, so I can keep the floor clear for the cleaners who will be here by next week, I hope, if the rain holds off. To keep me from going bonkers wanting to go play with everything and get these tool reviews going, I’m working on the new SketchUp video tutorials and setting up the new YouTube channel. I want to get 4-5 new posts up on the site before I switch themes, so the focus comes off the carvings, and it presents more of what I’ll be covering for the next 6 months. And, I need time to learn the new video making setup. I might post a few of those to get some feedback from y’all too. So, delayed, but still busy, and I know this is the right thing to do in the long run for ensuring I make the most money I can, as quickly as I can. The lesson here is that there is no business you don’t have to make some sort of investment in, with both money and education, so that you have the potential to earn more and faster. Same is true with websites, and I’m putting my money and time where my mouth is with the advice I give to y’all too. It’s been another slow site news week, and we’re all very happy about that!!! So, only a few tips to share with you. 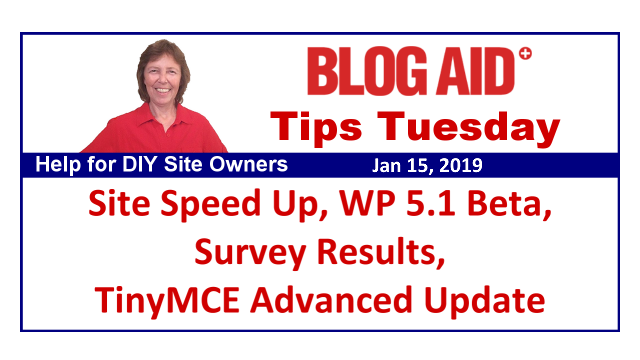 On Sunday I did my regular site updates and discovered that the TinyMCE Advanced plugin completely revamped its interface and settings for choosing between the two editors, which are the Gutenberg blocks and Classic type editor. So, I spent the rest of the afternoon updating my post on it. And, because it can still be confusing with all of the choices, I also do a livestream on the BlogAid Facebook page with a video run through. It’s embedded on the post now too. So, whether you are using Gutenberg or not, you will want to use the TinyMCE Advanced plugin, and go to the post to check your settings. Plus, keep in mind that if you don’t use Gutenberg, you can use TinyMCE Advanced in place of the Classic Editor plugin. You don’t need both. The next major update for WordPress is available for testing. WordPress 5.1 will introduce the first phase of a new Site Health Check system. You’ll be able to see site issues from within your Dashboard instead of having to contact your host to look at the log files. Another improvement will be an easier way to make a custom cron job. This is really going to help low traffic sites. The cron is WP’s clock that ticks every time there is a visitor to the site. It helps keep the time for scheduled posts and backups. But, if you don’t have enough visitors, the clock doesn’t track properly. To fix that, you have to create a custom cron job at your host to ping the site every so often. Perhaps they are looking to do that from within WP. So, if you are using a plugin for this function, you may be able to drop it. They are also raising the minimum PHP version to 5.6, which I find insanely odd since there is no longer any support for that version. The minimum now is PHP 7.1, and WP 5.x was only tested on 7.3. So, I hope they keep a fire lit under that for plugin devs to get with the program and start requiring free plugins to at least meet the current standards for speed and security. All total, they closed 360 tickets with this release, the rest being minor bug fixes. I’ve been testing it for the past few weeks as it was being developed and I’ll have full details for you as the official public release date approaches, which will be in the next week or so. This will be a major update, so it should not auto update. You will be doing it manually. Most of us only think of Yoast as the maker of our SEO plugin. But Team Yoast does way more than that. There are several team members that he pays to be part of the volunteer team that improves WordPress core. Their latest proposal will radically speed up WordPress. And, I hope this gets the ball rolling for speeding up plugins and themes too. They are directly addressing the css and js files that cause the first load time bottleneck. These are all the “render blocking above the fold” issues you see called out in speed tests. If you want to see how bad these things are on your site, go to my Helpful Posts https://blogaid.net/helpful-posts/ page and look in the Speed section. The very first one is how to accurately run and read a speed test. You’ll see the bottleneck of css and js files in the waterfall. These are also some of the things we look at in a site audit for what’s dragging your page load time and the low hanging fruit we can fix quickly and cheaply. Most of the time, those things are from plugins that are killing your site and need to go anyway. The rest are likely from your theme, which will give you a super heads up about what to avoid in your next theme revamp. Sassy Social Share is a great social sharing plugin, fast and lightweight. Great post MaAnna. I sure am thankful for these slow news weeks : ) and I’m so excited about the things you have planned!! I’m thankful for the slow news weeks too, Tipper!! I use Shared Counts by Bill Erickson, but it hasn’t been updated for WordPress 5.0+ support yet. Thank you! Added to the list. I’m sure he’ll get around to updating it. I’m like you, MaAnna – I’ve had my podcast for 100 years (actually 13) but have never used a podcast hosting service. I do use the Blubrry plugin, but not sure that’s who I want to go with, so have also been investigating Libsyn & Podbean. So I would definitely be interested to hear what you discover in your research. I’ve had a bit of a grudge against Libsyn for years, as their owner had a grudge with WP and iTunes for such a long time. He took forever to deliver integrations to the two biggest players in the game. However, folks get a LOT of exposure by being hosted there and it is still the biggest podcast repository on the planet. So, that’s where I’ll be looking to host first, though I am loathe to have to start paying for any file hosting after all these years of getting it so cheaply on AS3. Thanks MaAnna for your thorough updates as usual. I use Elegant Themes Monarch plugin for social sharing simply because it plays nicely with Divi.